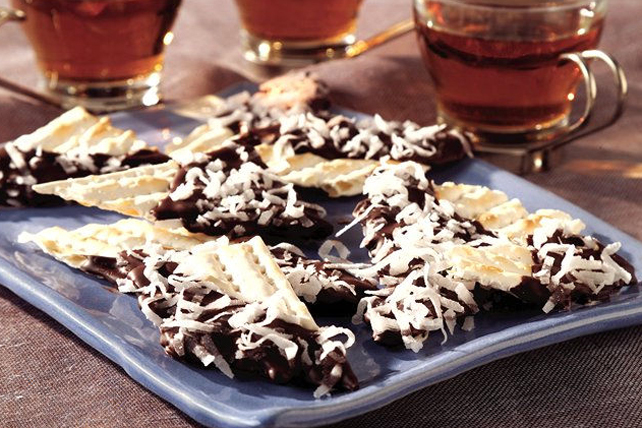 Lots of Passover recipes call for matzos, but none are as easy to make or scrumptious as these chocolate-dipped treats sprinkled with coconut. Dip matzo pieces, 1 at a time, partially into chocolate; place on prepared baking sheet. Since this recipe makes enough for 8 people, it's the perfect sweet treat to serve at your annual Passover gathering. Substitute your favourite chopped nuts for the coconut.